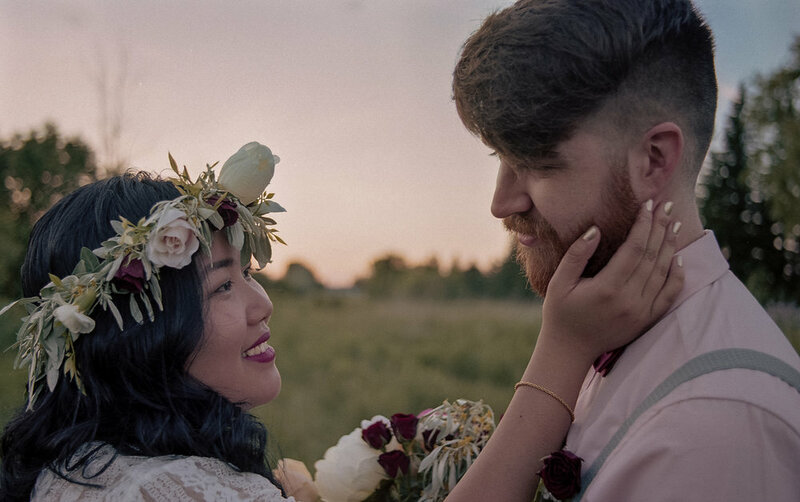 If you're looking for the most beautiful inspiration for your own wedding, or just really love trendy beautiful boho vibes, you've come to the right place! 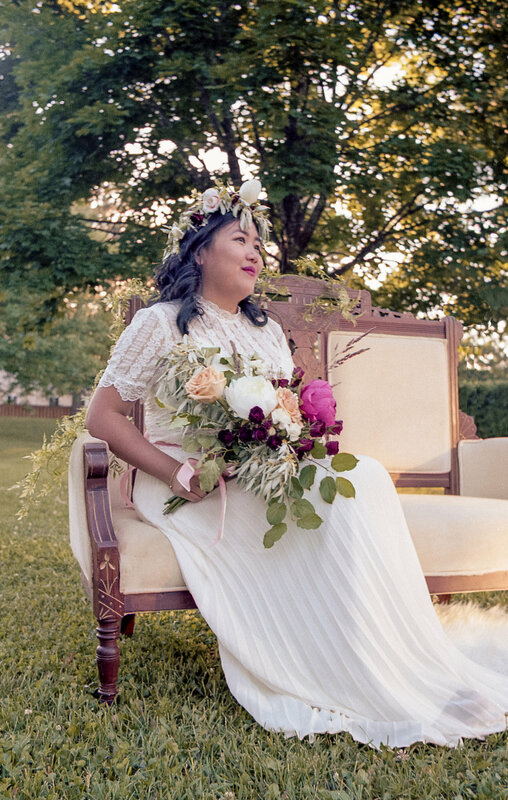 We headed out to the field for some beautiful golden hour portraits and incorporated my beautiful antique settee (she usually resides in my office- I've been well known to bring one of my many collected pieces of furniture to shoots and weddings) into the first locations images. 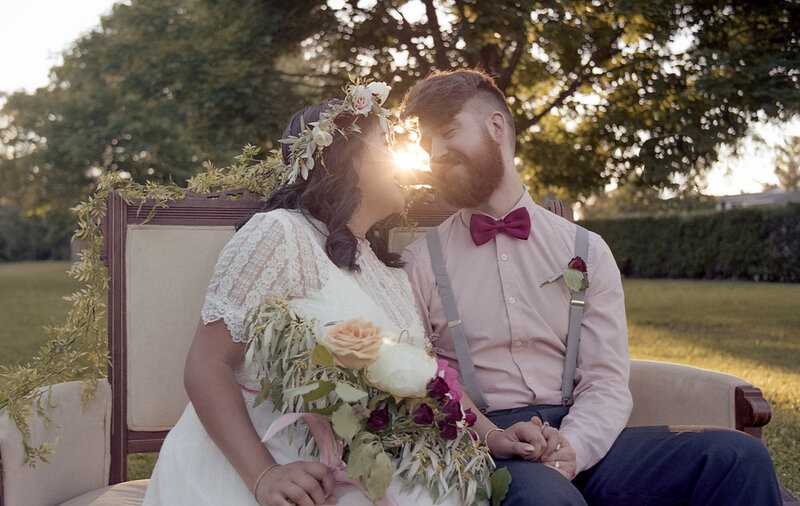 Can we please take a second to acknowledge the beauty that is the setting sun and lens flares in these images!! 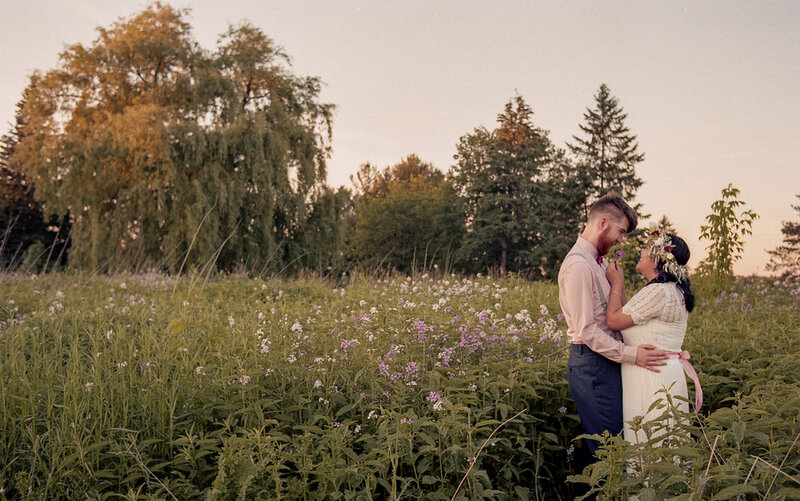 The second location wasn't far and features a beautiful wildflower field of phlox with willow trees in the backdrop. If you know me at all, you know I love a good willow tree, and try to incorporate them into a lot of shoots. The sunset completed the backdrop perfectly with a beautifully coloured sky. I don't know about you, but I LOVE the way sunsets look on film. Always have, always will. There is just something about the grain and colour combinations that have my heart. I started shooting with kodak portra 160 and switched to 400 as we lost lighting; you may notice what almost look like stars in some of the sunset images - this is a combination of the beautiful grain of portra 400 and dust spots that I purposefully did not remove in post processing. These two absolutely nailed the look, and I'm still in awe over these bridal portraits! 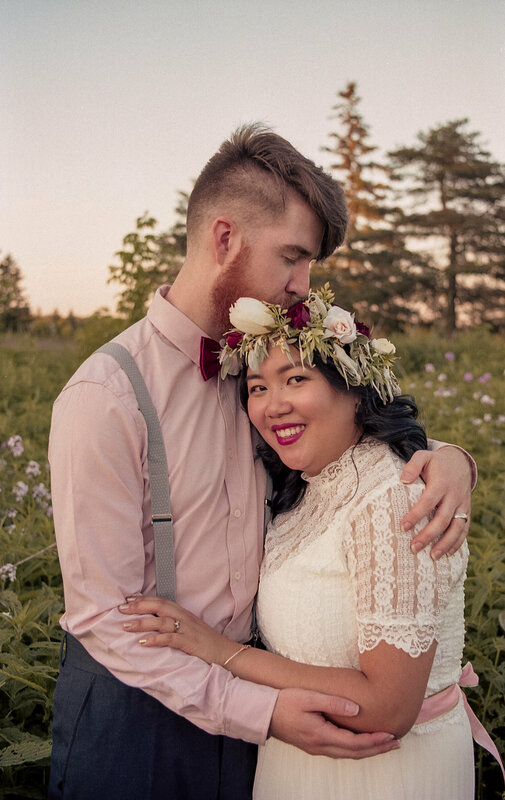 Cerise rocked a beautiful romantic flower crown accented with silver willow leaves and roses. 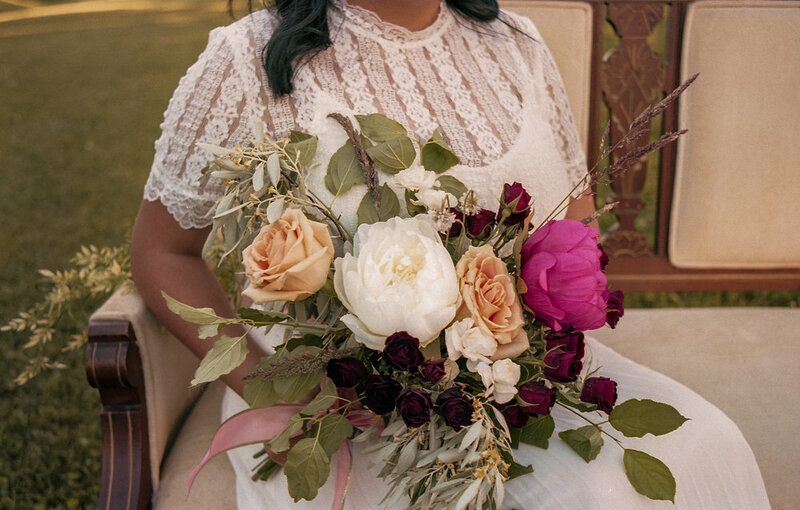 Her bouquet; a romantic wildflower boho feel completed with roses, peonies, perennial reed grasses and willow leaves amidst a bed of greenery. 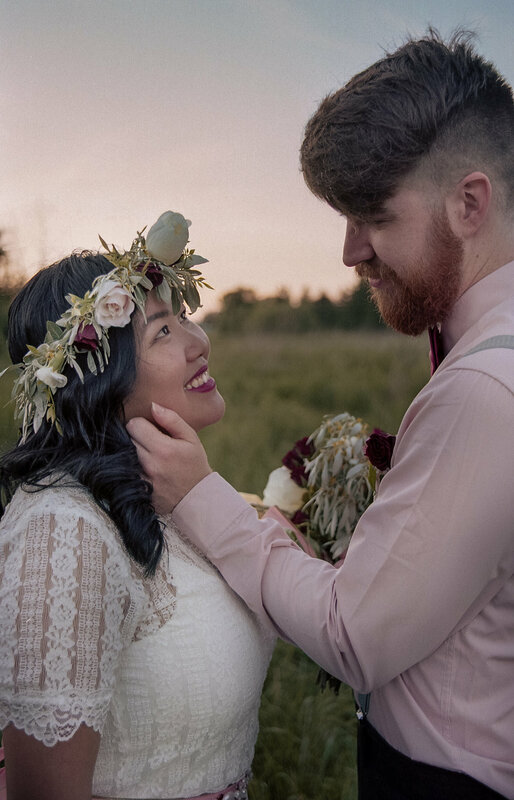 Her jewellery were all beautiful gold vintage pieces passed down from grama, and her flowy lace dress a two piece tied with a blush bridal belt. Let's not forget to comment on our very stylish groom! 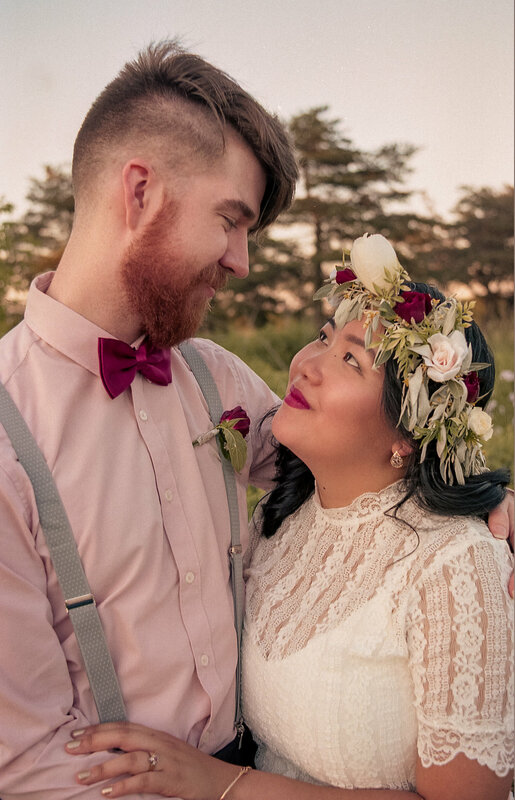 John's look featured a blush pink dress shirt for colour, paired with a lovely ruby red bowtie to perfectly match his lover's lips and jewels. 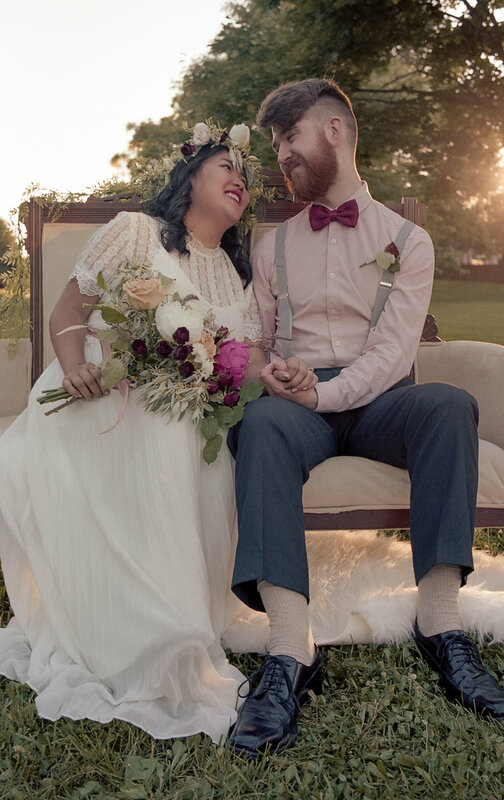 Suspenders, dark slacks, and a naturally killer beard completed this boho groom's outfit.